I have a guest post at the Changing Face, which is a blog of Wesley Lowe. Wesley is a filmmaker who asked me for some more commentary on the business side of filmmaking. I will be occasionally posting over there to give my thoughts from an investment analyst's viewpoint. When does the model NOT work? How to resolve this crisis in macro-economics? The field must be revamped fundamentally. Some of its shortcomings are obvious. Before the financial crisis, most macroeconomists were blinded by the idea that efficient markets would take care of themselves. They did not bother to put financial markets and the banking sector into their models. This is a major flaw. What a lot of modelers have forgotten is the first rule about model building: understand your assumptions. Under what circumstances will the model fail? If you can’t answer that question, or if you believe that the model works under all conditions, then you haven’t fully thought through the modeling process. Take the example of my inflation-deflation timer. While the backtest results look promising, when does this asset allocation model fail? The inflation-deflation timer was built for a bifurcated environment where investor sentiment is likely to move from one extreme of inflationary heat to the other extreme of deflationary freeze, but not much in between. If other factors were to emerge in the years to come that drives growth patterns, e.g. nanotechnology becomes a transformative technology or the emergence of longer human lifespans changes investment and consumption patterns, the performance of the inflation-deflation timer would become unstable. I try to think about the basic underlying assumptions behind my models. Do macro-economists do the same? Do you? Model update: The inflation-deflation timer continues to signal a "buy inflation" reading. This chart, along with their announced direct investments, seems a lot like the effects of a long-term investment policy that doesn’t change easily. Many of the announced investments are of the FDI (foreign direct investment) variety, which cannot be sold easily like a stock holding. While there are some indications that China may be pulling back on their commodity demand in the short-term, don’t mistake tactical decisions with the long-term strategic picture. 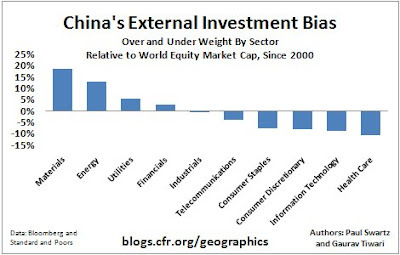 As long as China is growing, it will mean a secular friendly environment for commodity bulls. Regular readers know that I have been skeptical of this equity market rally (see examples here and here). My opinion is confirmed by many commentators that I respect. Jeremy Grantham of GMO wrote in his 2Q letter that their estimate of fair value on the S&P 500 is slightly south of 880 and the index could move to between 1000 and 1100. In addition, reports of high levels of insider selling is not comforting for the bulls. We may have seen a rare "double non-confirmation." On August 27 the Dow closed at 9580.63, a new Dow high for the rally. On the same day the Transports closed at 3714.63, which was not a new high -- in so doing, the Transports failed to confirm the Dow. Today the Transports closed at 3806.75, a new high for the ]Transports. But today the Dow closed at 9547.22, below their August 27 close -- in doing so, the Industrials failed to confirm the Transports. This is what I call a rare "double non-confirmation". First, the Transports were weak in that they could not confirm the Industrials. Today the Industrials were weak in that they could not confirm the Transports. These rare "double non-confirmations," in the past, have tended to signal the top. Bespoke also pointed out that the S&P 500 is now 20% above its 200-day moving average, the first time this has happened since 1983. This suggests that the market is very overbought and due for a pullback. There’s just some eerie things about this—it’s reminiscent of spring and summer of ‘87 when nobody believed the rally and it kept going up despite skepticism, people shorting into it. It ate them alive until it suddenly turned. Are we in for a repeat of the Crash of 1987? Three-month London interbank offered rates, or Libor, for dollar loans are at a record low and fell below those for the yen on Aug. 24 for the first time in 16 years. Think about the turbulence that would be unleashed by the dollar suddenly shooting 5 percent or 10 percent higher with untold numbers of traders around the globe on the losing side of that trade. It could make the “Lehman shock” look manageable. Remember that in 1987, the stock market didn’t just spontaneously decide to crash in a single day. Before the October crash, the market had topped in August and was steadily declining before it took the ultimate plunge. Today we have the combination over-valuation and high risk behavior, but these things have a way of not mattering to the market until they matter. I respect Barry Ritholz’s comment that the current rally could very well be in the 6th or 7th inning. The key to timing any potential downdraft is to watch the bearish tripwires. Here is what I am watching for. One is investor sentiment. James Grant, who could usually be counted on to be not just bearish, but apocalyptic, has become a bull. Despite this sign of bearish capitulation, the chart below of public sentiment, as measured by the AAII survey, is not excessively bullish. As I pointed out in my previous post Risk on, the risk appetites are still rising. For the bear to truly come out of hibernation, investors have to show signs that their taste for risk is becoming sated. 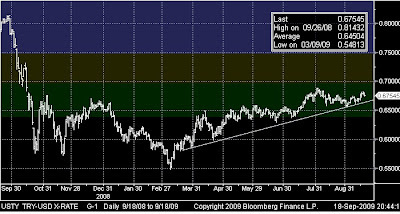 The chart below of the euro/yen cross, a measure of the risk trade, is still trending upwards. If the USD is now the preferred currency of choice for the carry trade, then let’s look at some emerging market currencies against the greenback. The chart below of the Hungarian Forint against the Dollar remains in a healthy uptrend. The Turkish Lira is also in an uptrend against the Dollar. 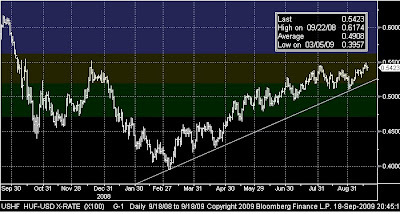 Commodity prices, which is an indication of the progress of the reflation trade and risk trade, are also in an uptrend. Until these bearish tripwires are crossed, the path of least resistance for equities is still up. My inner trader tells me it’s too early to get outright bearish. The 50% Fibonacci retracement level for the S&P 500 is roughly 1120 - and under the circumstances that may be a realistic short-term target. On the other hand, the trigger for the 1987 decline was the Fed's August decision to raise interest rates. While I have expressed my doubts about the willingness or the ability of the Federal Reserve to effectively implement its exit stratgies, the FOMC statement on Wednesday bears watching. I know that this is slightly off-topic from my usual posts about the financial markets and investment processes, but as investment analysts there is real value in neglected investments. Academics call this the neglect effect. A friend passed the following neglected story on to me which I thought I should share with you. Do You Know What These Two Men Have In Common? They both died June 25th, 2009. One has been covered 24/7 by the media the other has been forgotten. You're a 19-year-old kid. You're critically wounded and dying in the jungle in the Ia Drang Valley , 11-14-1965, LZ X-ray, Vietnam . Your infantry unit is outnumbered 8-1 and the enemy fire is so intense, from 100 or 200 yards away, that your own Infantry Commander has ordered the MediVac helicopters to stop coming in. You're lying there, listening to the enemy machine guns, and you know you're not getting out. Your family is half way around the world, 12,000 miles away and you'll never see them again. As the world starts to fade in and out, you know this is the day. Then he flies you up and out, through the gunfire to the doctors and nurses. And he kept coming back, 13 more times, and took about 30 of you and your buddies out, who would never have gotten out. Medal of Honor Recipient Ed Freeman died on Wednesday, June 25th, 2009, at the age of 80, in Boise , ID. There is real value in neglected stocks and people, regardless of anyone's opinion of the Vietnam war. Gold and silver are behaving well but they too, are overdone. You don't have to be 100% invested all of the time. If you have some profits, take some money off the table. If you don't have profits, you haven't been reading me for the last nine months. We probably are not at exactly a trading top but we are pretty close. Better to sell a day early than a day late. The last time he warned on gold was on March 7, 2008, just before the metal price fell apart. I pointed out the high risk condition and got a lot of hate mail for it. This time, Barrick’s de-hedging program and equity issue may have been the signal to tactically turn cautious on the precious metal complex. Nothing goes straight up. Be warned. Recession is over, what now Ben? Is Quantitative Easing a roach motel? Does the Fed take its foot off the accelerator in its quantitative easing? Former Federal Reserve governor Laurence Meyer believes that there is widespread angst among Fed officals about exit strategies. Is quantitative easing becoming a roach motel? It’s easy to get into but hard to get out? Financial markets have not fully understood that the U.S. Federal Reserve's pledge to keep interest rates exceptionally low for an extended period means they will stay low beyond when officials normally would raise them, a top Fed official said on Friday. "I don't think markets have really digested what that means," St Louis Fed President James Bullard said in an interview. The Fed's strategy is aimed at promoting a future rise in inflation, which should provide an immediate boost in activity in anticipation of a future boom, but that hasn't happened, Bullard said. If a strong recovery somehow takes hold, then rising inflation expectations should help the metals and be an even bigger tonic for mining shares. If the economy slips back into a funk, then a new round of policy responses (that we cannot afford) will gush forth, harming the dollar and thus helping the metals. The only way precious metals could really get hurt is for Bernanke and his central banking colleagues around the world to guide the global economy to a perfect, soft, noninflationary landing. 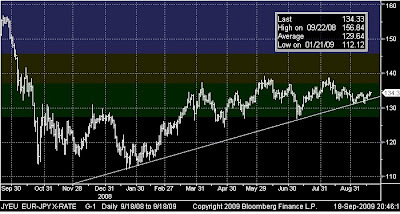 If you think Bernanke and his buddies can usher in a painless return to the Goldilocks era, then avoid precious metals. Stocks, bonds, commodities, and the precious metals can all – in the short run – benefit from the liquidity provided by overly easy monetary policies. The recent positive correlations among these asset classes may be sending just such a message. Eventually, however, the asset classes will have to part ways. 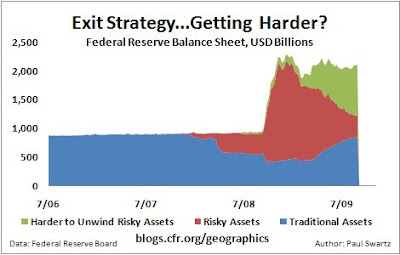 I think the central bankers will find a way to overstay their welcome, leaving the only monetary asset they can’t print as the asset of choice. Meanwhile, my Inflation-Deflation timer is telling me to stay with the reflation trade. There has been a lot of hand wringing lately about how the efforts to regulate Wall Street have gone nowhere (see example here). We’ve had the likes of Paul Volcker weighing in on what banks shouldn’t be allowed to do because of the effect on systemic risk. There have also been various proposals on regulating compensation on Wall Street. Think about it: you as the insurance company did your best job to estimate the risk involved. You did it assuming that policies could not be sold, whether really or synthetically. You already knew that those who were healthy in the future would surrender and seek another carrier, but thought the those who were less healthy would persist to some degree. Well, with life settlements, the unhealthy persist at a much higher level, which bites into profits. This is the box that life insurers are in. They can’t lock in policyholders, but policyholders can hang on, refinance (so to speak), or sell off their obligations. That is a tough equation for life insurers to work through, and to the degree that life settlements are allowed, premiums will have to rise to compensate for the loss of profitability. Right now, the Wall Street incentive system is overly asymmetric. Instead of constraining banks on what they shouldn’t or shouldn’t do, regulator should set up a system that more naturally regulates behavior. Investment banks lost their way once they became public companies. The compensation of its traders and executives became more and more asymmetric. In effect, they were given call options on the cash flow of the firm. Being human beings, they behaved accordingly. At the same time, there were fewer and fewer incentives to exercise adult supervision. Society should be telling Wall Street the following: "You are free to innovate and make piles of money. If you make the wrong bet and take on too much risk, then you are free to blow your financial brains out. But if you blow out your (metaphorical) brains, don’t splatter it all over my living room so that I have to clean it up. " Bringing back the partnership investment bank solves most of those problems. 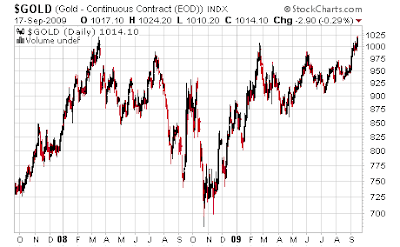 Is Barrick responsible for gold at $1,000? Bespoke recently asked the question: Did Barrick jinx gold again? Dehedging by the world's largest gold producer, Barrick Gold Corp. (ABX), has been the driving force behind gold's move above $1,000 a troy ounce this week, a price level analysts say is unsustainable. "We have more buying to do," the Barrick spokesman said. India's gold market, which is one of the largest sources of physical gold demand, is showing signs of lukewarm demand. What's more, I posted a few days ago that the US bond market could be poised for a rally. Could this rally in gold be the final capitulation of the bond bears (and conversely the gold bulls)? I remain a long-term commodity bull, but nothing goes straight up. For the gold bugs who want to send me hate mail, I refer you to this. As gold breaks above the magic $1,000 level and the US Dollar weakens, more and more headlines are coming across that suggests that the center of gravity is shifting away from the United States. The UN wants to replace the US Dollar with a global currency. The World Economic Forum's competitive report now shows that Switzerland has moved ahead of the US as the world's most competitive economy. Profit generated by China's 500 largest firms outstripped earnings of the 500 biggest companies in the US for the first time. Time magazine is asking Is Asia forming a new trade bloc? Speaking of China, isn't fascinating that the market now listens and even convulse based on the utterance of leading members of the Chinese Communist Party? The blogger Cynicus Economicus posted on the Dire position of the US economy. 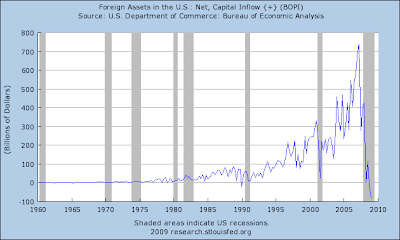 In addition to all the data points indicating the sad state of the American economy, he shows that foreigners are pulling funds out of the US. In this issue we explore if the U.S. is making the same mistakes as Argentina did a century ago. Will the U.S. see its competitiveness erode, its economy weaken further and the U.S. Dollar continue its decline? A weakening of the U.S. Dollar could be bullish for commodities. James Carville, advisor to then president Bill Clinton, famously said that he wanted to be reincarnated as the bond market so that he could intimidate everybody – that’s because the bond market is usually right. So what is happening with the bond market? The CFTC's Commitment of Traders report shows that large speculators (read: hedge funds) are either in crowded short or near crowded short positions in the 10-year and the long bond. The chart below shows the net position of large speculators in the long T-Bond futures contract. Readings were in a crowded short and there has been some minor short covering. Coincidentally, long bond yields have fallen through a support line and bond prices have begun to rally. In the 10-year, large speculators remain in a crowded short. …and yields are sitting right at technical support. These sentiment readings are evocative of a stretched rubber band ready to snap back. You don’t often see crowded long or crowded short positions in futures contracts. The dual crowded short readings in both the 10-year and long bond are even more rare and confirm my belief that the bond market is poised for a tactical rally. The equity rally is part of the overall “buy risk” trade that investors have been engaged in for the past few months. A clue to its longevity is to look at other markets to see how they are faring, so that we can understand whether the bull or the bear is in control. 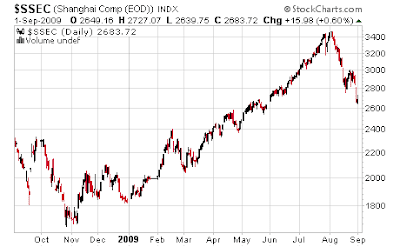 You have to be a market hermit to not know that the Shanghai market has rolled over. China had been the last hope of strength in a growth starved world. Moreover, the Baltic Dry Index, as an indication of world trade, is also falling. China had been a huge user and accumulator of commodities in the past few months and therefore fueled the rally in prices. Despite the crack in the Shanghai market, it is interesting that commodity prices, in aggregate, remain in a fragile uptrend. Another element of the risk trade is the currency carry trade. So how is the carry trade doing? The chart below shows the New Zealand Dollar/Yen cross, a favorite of the carry-traders. This trade is now testing its uptrend line, but until that line is breached, the bulls should be given the benefit of the doubt. Here is the Turkish Lira/Japanese Yen cross. Same story – as NZDJPY, the uptrend is intact, but barely. What about Eastern Europe? Remember how Eastern Europeans had mortgaged their property purchase in a low yielding currency like the Swiss Franc? Here is the Hungarian Forint/Swiss Franc exchange rate. Interestingly, FX traders had been in that trade since early March. It breached its uptrend line mid-August and it appears to be in the process of rolling over. Finally, we visit the Mexican Peso. Mexico was the subject of an S&P warning about its debt, but that weakness appears to have been widely telegraphed in the FX market. Are the bulls or bears in control? I have warned about the risks of this equity rally (see examples here, here and here). Instead of trying to call the turn in the market, some of these aforementioned indicators are a clue of whether the bulls or bears are in control of this market. Right now, it appears that they are in a tug of war. Many of the indicators are now testing their uptrend lines. If they get breached, then it is a clear sign that the bears have won the upper hand.